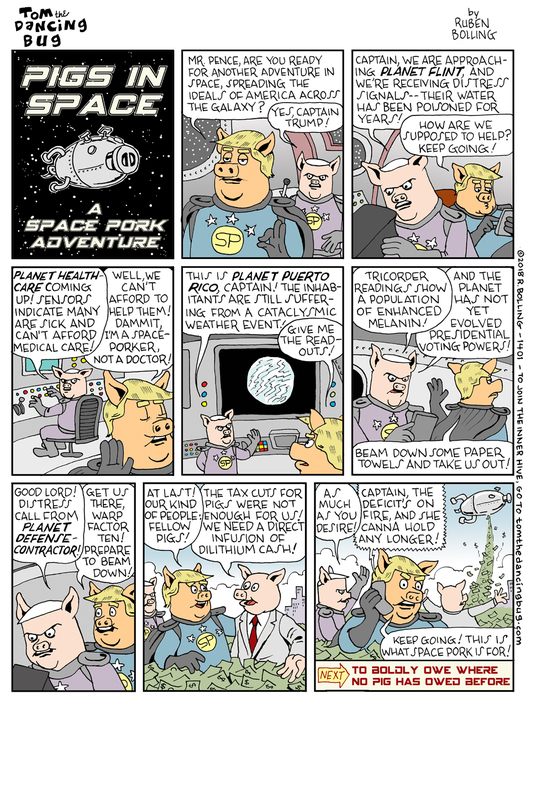 Tom the Dancing Bug, IN WHICH Pigs in Space's four or eight year mission is to use Trump's Space Force to seek out new life and new exploitations. "The EMU Club inhabits exactly the world I always hoped to live in when I was 12, when the answer to questions like 'Where did I put my toy' led inevitably to alien conspiracies and secret underground tunnels. A book for the curious and adventurous!" -Cory Doctorow, author of "For the Win" and "Little Brother"
Get Book the First, "Alien Invasion in My Backyard," here. Get Book the Second, "Ghostly Thief of Time," here. RESIST!! The temptation to not join Tom the Dancing Bug's INNER HIVE!